There are a lot of geographic blindspots in my film viewing and a pretty big one is the Middle East. It maybe isn’t quite the blindspot that African cinema is, but with that continent I at least have the excuse of most of the rest of the film world being about as uneducated as I am. I’m not completely unversed in cinema from that region, I have a reasonable knowledge of Iran’s unique brand of brainy experimentation and if you include movies from places like Turkey, Israel, and North Africa I’m sure seen a couple dozen or so movies from the area and obviously that’s more than most people but compared with the number of movies I’ve probably seen from individual countries like France or Japan it’s really nothing. On top of that there isn’t really that much of a shortage of movies from the Middle East, like clockwork there tends to be at least one or two movies a year being imported in hopes of competing for that Best Foreign Language Film Oscar, and that might actually be part of the problem. 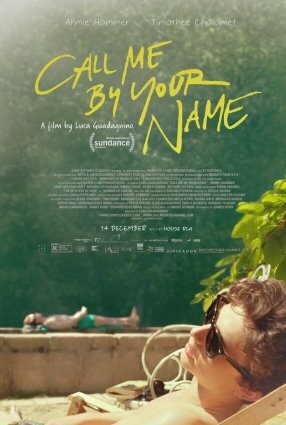 The movies from the middle east that they try to import around award season are universally about these countries’ social and political problems and they almost always draw reviews that are respectful but not overwhelming in their praise. This year’s contender for the “important movie from the middle east” award is the new Lebanese film Capernaum, and I’ve decided to give this one a go. 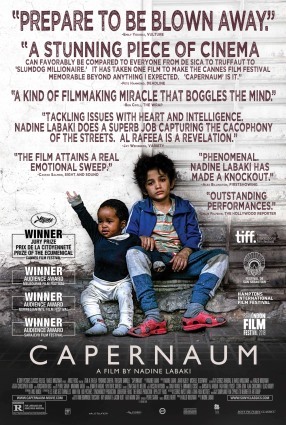 Capernaum begins in a Beirut courtroom where a child named Zain (Zain Al Rafeea) who’s currently serving a prison sentence for stabbing someone has had his parents Souad (Kawthar Al Haddad) and Selim (Fadi Kamel Youssef) brought in as defendants in a lawsuit. We’re told that these parents are ostensibly being sued for bringing Zain into a world of suffering, which more literally seems to be a suit for abuse or neglect or something (the legal grounds for all of this are rather vague). We learn that his parents had way more children than they can afford to support and never bothered to get any of them real birth certificates or papers. When these plainly awful guardians marry off Zain’s eleven year old sister Sahar (Cedra Izam) for dowry money Zain goes into a rage and run away from home. While away he encounters an illegal Ethiopian immigrant named Rahil (Yordanos Shiferaw) who takes him in and gives him room and board in exchange for his watching her infant son Yonas (Boluwatife Treasure Bankole) while she’s at work, which goes pretty well until one day Rahil is rounded up in an immigration raid and Zain is stuck having to find a way to keep this kid alive while alone on the streets. On its most basic level Capernaum is a kind of neo-neorealist movie about the life of a street kid in the poorest sections of Beirut. Zain is said to be about twelve in the movie (not knowing his actual age is something of a plot point) but he looks like he could be nine or ten and seeing him in this harsh environment is supposed to be a bit jarring. He speaks in very vulgar street terminology and while he does clearly have conscience he doesn’t seem to think twice about petty theft. This reminded me a bit of the Moroccan film Ali Zaoua: Prince of the Streets, which came out about twenty years ago and also looked at the life of street kids in the Arab world, but where that really focused on a group of kids in this position this one really focuses in on Zain as a solitary figure alone in the city. The idea of people being alone in this cruel world is a bit of a recurring theme: Rahil seems to be similarly without anyone to depend on as her neighbors seem to be needlessly hostile towards her and she doesn’t seem to have a single friend who can help Yonas once she’s put in jail and the few people who should be acting as a support system like Zain’s parents seem to completely fail him. Where the film starts to go astray is in its framing story. The trial that is meant to be the catalyst for much of this reflection makes very little sense if taken literally. I’m no expert on the Lebanese legal system but I doubt that there are any legal grounds for someone to actually sue their parents for choosing to bring them into the world and even if that is meant to be a stand-in for a more mundane charge like child neglect that would still be an unusual place to tell this whole story given that the parents aren’t even present for something like 60% of the story that Zain is telling. Even if you look at the trial sequences purely as a sort of metaphoric soapbox I’m still not exactly sure I’m on board with what the movie is saying. Zain’s final word on the matter is that he wants his parents to stop having so many damn kids they can’t afford, which is a message that rings a bit too close to the kind of “welfare queen” shaming that often characterizes discourse about poverty in this country. The movie isn’t completely in the position of demonizing poor parents as Rahil is clearly held up as an example of the kind of “working poor” who doesn’t deserve the misery she receives, but all too often the movie seems more interested in blaming poor people for their problems rather than highlighting the societal ills that are really at the heart of these problems. Ignore all that though and Nadine Labaki has still made a pretty compelling human story which seems to capture the environment it’s trying to shed light on pretty effectively. Making yet another Rocky movie in 2015 certainly seemed like a crazy idea at the time, in no small part because I thought that trying to bring it back in 2006 was also kind of silly, and for that matter the decision to make the very first Rocky sequel back in 1979 was kind of suspect. And yet, the movie Creed pretty effectively proved me wrong. That spinoff about the son of Apollo Creed seeking out Rocky to be his trainer was a clear critical and financial hit and I think its success probably says less about how much life was still in the series than it does about what bringing in new talent can do to revitalize a franchise. That new talent was Ryan Coogler, a director who was plainly a better visual stylist than Sylvester Stallone and John G. Avildsen ever were but who did maintain an understanding of the series and why people loved it. There were limits to my personal enthusiasm for it, I thought it was a very solid movie that achieved what it set out to do very well, but I wasn’t one of the people claiming it was some kind of outrage when it wasn’t a Best Picture nominee. Still, the movie was a clear win and given that this franchise pretty much can’t be stopped it seemed inevitable that it would keep on going from there. Unfortunately for the sequel, Ryan Coogler was too busy making Black Panther and generally taking over Hollywood to direct the sequel, so a relatively untested young filmmaker named Steven Caple Jr. has taken his place. 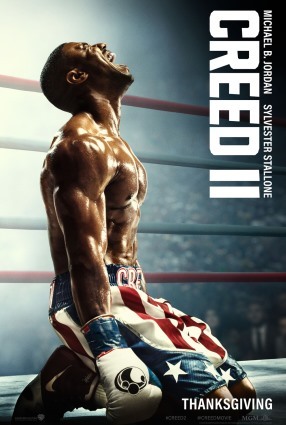 Can he continue to elevate the franchise with Creed II? This sequel begins a few years after Creed and in that time Adonis Creed (Michael B. Jordan) has come into his own as a fighter and as the film is opening he’s winning a championship fight bout without too much trouble against a complacent champion who’s past his prime. After the fight he proposes to Bianca Taylor (Tessa Thompson) and the two begin planning for their future. However, on the other side of the world in the Ukraine another fighter named Viktor Drago (Florian Munteanu) has been training with his father Ivan Drago (Dolph Lundgren), the same Ivan Drago who killed Apollo Creed in the ring in Rocky IV, and they have been waiting for Adonis to become the champion so they can challenge him and use the likelihood that he would accept such a fight in order to find their way into the boxing spotlight. Rocky Balboa (Sylvester Stallone), who feels a great deal of guilt over what happened to Apollo in that fight thirty years earlier, believes that accepting this fight would be a major mistake and that stirring up this old emotions is not worth whatever sense of family redemption this fight would offer. Adonis, however, does not heed this advice and accepts the fight. When I first heard that they were planning to incorporate Ivan Drago’s son into this sequel I thought it was a terrible idea, in part because Rocky IV is a very stupid movie rooted in empty Cold War era patriotism and going out of its way to acknowledge its existence within the series continuity seemed like trouble. To the movies credit they do manage to make the Dragos feel relatively grounded and do a pretty good job of just ignoring the part where that movie implied that Rocky singlehandedly brought down the Soviet Union through his inspiring performance in the ring. That said, its occasional attempts to humanize the Dragos and make them into characters unto themselves do fall flat for the most part. 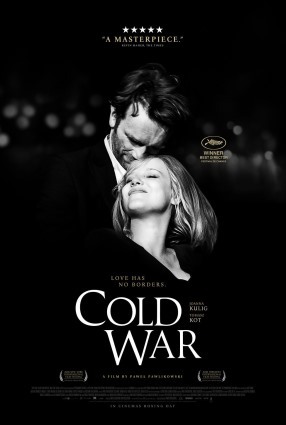 The film tries to establish that the two of them have a well-earned chip on their shoulder because of the way Ivan was abandoned by the Soviet propaganda machine after his loss to Rocky, but they depict this in rather broad ways and I kind of hated a device they used involving Drago’s ex-wife. It also doesn’t help that Dolph Lundgren has proven to be a much less interesting and resilient actor than Sylvester Stallone and that the dude they found to play Viktor was an athlete chosen for his physical prowess rather than his acting abilities. Despite all the invocations of Rocky IV, the film actually more closely follows the formula of Rocky III. After Creed accepts the fight and tries to train without Rocky the big fight begins before we’re even at the half-way point and you’d pretty much have to be an idiot not to guess that this first fight isn’t going to go very well for Adonis. So, much like when Rocky went up against Clubber Lang before him Adonis finds himself as the pampered champion underestimating his foe and having to find a way to regain the eye of the tiger after an embarrassing defeat. That is generally the problem with this movie, it’s undeniably formulaic and feels like a retread. Of course the first Creed also mirrored a lot of stuff from the original Rocky but it felt like it was adding a bit more of its own flavor, in part because Adonis Creed felt like more of a distinct character in that film. Here Adonis straight up just feels like nothing more than a younger and slightly more articulate Rocky Balboa. The film does rub up against a slightly original idea of having Rocky question whether Adonis really “needs” to fight this guy and Adonis does seem to be swayed by this and mature out of all this toxic masculinity trap… but this is a Rocky movie so we can’t actually have our hero back down from a final fight so they just sort of throw all that out at a certain point and go along with the formula. All that having been said the boxing scenes kind of save the movie. Actually there’s plenty to criticize there as well. Michael B. Jordan looks way more like a light heavyweight (the weight class he was fighting in in the first movie) than a heavyweight and I have my doubts about any state athletics commissions allowing a fight between him and the plainly much larger Drago. Also things happen in the ring which are just kind of nuts (the final round in particular has to be the longest three minutes in temporal history) and nothing is as strong as the fights from the first Creed, but despite all that the film’s close up and impactful pugilism is still pretty enjoyable. That’s the thing about this movie, it kind of works in spite of itself. I maintain that it feels way more like the old Rocky sequels than Creed (something that probably has a lot to do with that fact that Stallone is once again writing), but… as dumb as those movies got most of them were kind of fun in spite of themselves as well. Still, I don’t have a very good feeling about this series going forward. I’m sure there will be a third film but I do hope they don’t get it in their heads to make five Creed movies like they did five (well, six) Rocky movies and that they heed this film’s lessons about avoiding the mistakes of the past more than Adonis does. So, Melissa McCarthy is still around. I must say I didn’t think too much of McCarthy when she broke onto the scene in Bridesmaids, or perhaps more specifically I didn’t see what the big deal was but then again I didn’t quite grasp what the big deal was with that whole movie. Still, a lot of people liked it and the performance somehow managed to get a damn Oscar nomination. She’s stuck around too even though she’s made all sorts of crap like Identity Thief, The Boss, and The Happytime Murders, but that hasn’t hurt her because the simple fact is that most mainstream comedy film stars mostly make crap these days. Whether you’re Will Ferrell, Adam Sandler, or Kevin Heart the dirty little secret about being a mainstream comedy film star is that, like being a baseball player, you can strike out in two thirds of you’re at bats and still be a star. And remain a star she has even though The Heat and Spy are probably the only unambiguous commercial and critical hits of her post-Bridesmaids career. 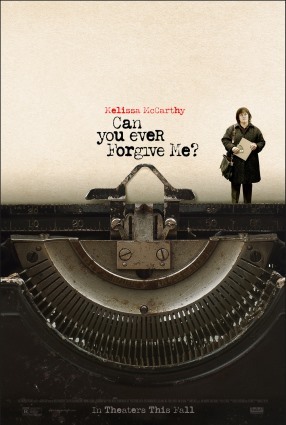 And now right on time McCarthy has taken the next important step in a screen comedian’s career: taking a more serious role, which she’s done in the new film Can You Ever Forgive Me? In Can You Ever Forgive Me? McCarthy plays Lee Israel, a writer who achieved some moderate success in the 70s and 80s writing magazine articles and celebrity biographies but who has fallen on hard times by the late 90s when the film begins. She’s just lost her job at a publication for surly behavior and the public has lost a lot of interest in the literary showbiz figures she used to write about. She now lives out of a cheap New York apartment she probably can’t afford with only a beloved cat and she clearly has a drinking problem. After being told by her agent (Jane Curtain) that there’s basically no way she’s going to be given an advance for her proposed biography of an obscure vaudeville comedienne Israel finds herself unsure if she’s going to even be able to pay her bills. Desperate, she decides to sell a letter she got from one of her celebrity subjects to a local book store, and in doing so she starts to wonder if maybe she could manufacture more such letters. Soon she and her more streetwise friend Jack Hock (Richard E. Grant) are running something of a two person forgery ring which may or may not catch up with her. 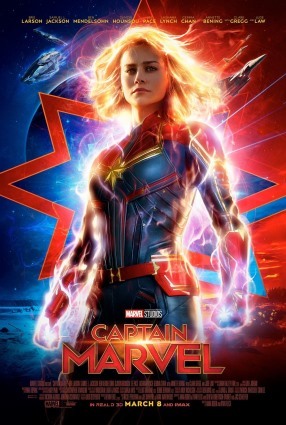 I don’t think my review of this movie is going to be overly long simply because it doesn’t elicit a whole lot to talk about despite having very little wrong with it and it generally being the very definition of a movie that’s “fine.” The film largely operates as a character stud of Lee Israel and her misanthropic lifestyle. Israel lives alone and seems to be largely content with this, claiming to like her cat more than most people. It’s not entirely clear if she truly believes that or if it’s more of a defense mechanism, more than likely it’s a combination of the two. Her friendship with Jack appears to be a bit of a bright spot, one born of their mutual outsider statuses. Her criminal activity is by contrast a bit of a secondary element. Her forging is somewhat interesting but her operation is interesting and impressive but not exactly the stuff of legend. Ultimately the forging is less interesting in and of itself than it is for how it sort of gives her life purpose. In this sense she’s sort of a low stakes non-violent Walter White, an ordinary person who enters into a life of crime partly out of financial necessity and partly as a sort of midlife crisis. Melissa McCarthy is quite good at potraying this character and making her sympathetic. If look up pictures of the real Lee Israel you find that McCarthy doesn’t really look that much like her but this doesn’t really matter too much because she certainly seems to understand the character type she’s working with and manages to give the character enough levity to keep her lifestyle from seeming rather depressing. Beyond that this mostly just strikes me as a rather serviceable drama. The film certainly looks good and evokes early 90s New York fairly well, but it’s not doing anything particularly bold visually, not that it needs to. I also wouldn’t say that the drama here, I guess there are ultimately limits to how interesting I find this character and this story, but for what it sets out to do the film acquits itself fairly well and I don’t have much to complain about.